Not sure how simple this is to do, but could something be implemented via a combo input (such as shift + right click or anything else tbh) to reset a UI variable to shader default? If it's inefficient to read the shader after compilation, perhaps the default values could be stored in the user saved ini alongside the modified values. I'm not sure since I'm not really any kind of programmer. This isn't easy to do and would require some ugly hacks I'd much rather avoid. ReShade doesn't preserve defaults. They are gone as soon as you change the value. That's too bad. 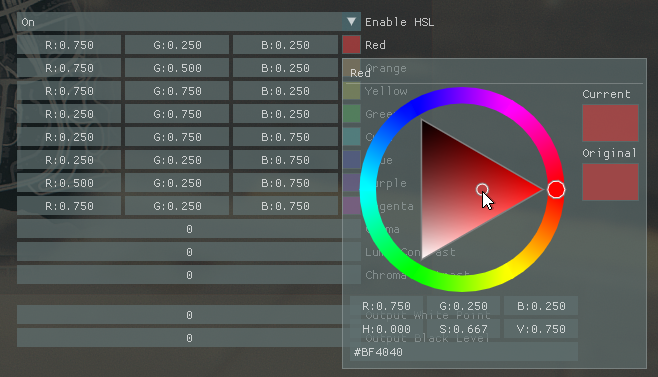 I have an HSL shader setup here that cries every time I have to reset the values. @TreyM Where did you get this HSL shader? Could you share it, please? It seems amazing! Last Edit: 11 months 2 weeks ago by Durante_. It was written by my friend kingeric1992. I'll see about getting him to release it. Maybe you could put default value info in ui_label name? Like "Red (default #BF4040)"
Last Edit: 11 months 2 days ago by Fu-Bama. That's already been done. it's not ideal, and that isn't the point. It's still a massive pain to reset every single value. As an alternative, it can solve by 2 changes. disable technique. press the reload button. Last Edit: 8 months 1 week ago by seri14.